Central Illinois Allergy and Respiratory Services Ltd.
A 46 year old immunocompetent Caucasian female presented with a 2 week history of right sided chest discomfort, nonproductive cough, shortness of breath, and myalgias. Her shortness of breath was worse with activity and when lying down. She had no fever, chills, skin rash, or weight loss, and she denied any other complaints. Her past medical history was significant for iron deficiency anemia, migraine headaches, eczema of bilateral hands, and an episode of severe acute bronchitis thirty years ago. There was no history of preexisting pulmonary disorders. Her medications included oral contraceptives and albuterol metered dose inhaler to be used as needed (the latter was given to her for a presumptive diagnosis of asthma since the onset of her symptoms). She denied cigarette smoking and illicit drug use, and had minimal alcohol use. She worked as a legal assistant and denied any unusual hobbies or occupational exposures. She kept two canaries at home which were both healthy. She used an indoor hot tub at her home on a near daily basis for the last four years and had changed the water in the hot tub once or twice a year. Her family history was significant for coronary artery disease in her mother. Her physical examination revealed a slender woman who did not appear ill with stable vital signs. She was in no obvious respiratory distress. She had fine bilateral inspiratory and expiratory crackles diffusely present in all lung fields on auscultation. In addition, she had mild scoliosis and eczema involving dorsa of bilateral hands. Her chest radiograph showed bilateral interstitial infiltrates without any mediastinal or hilar lymphadenopathy. Her laboratory evaluation revealed a normal complete blood count, chemistry panel, B- type natriuretic peptide level, cardiac isoenzymes, and erythrocyte sedimentation rate. Her antinuclear antibody levels were normal. Her purified protein derivative (PPD) skin test showed less than 5 mm induration at 48 hours. Hypersensitivity pneumonitis screen was negative for the following antigens: Aspergillus fumigatus, Micropolyspora faeni, pigeon serum, thermophilic actinomycetes, and Saccharomonospora viridans. A spiral computerized tomography scan of her chest ruled out pulmonary embolism and revealed bilateral ground glass opacities with diffuse micro-nodular appearance (figure 1). Her pulmonary function tests (Table 1) showed a mild obstructive defect with air trapping and moderate decrease in CO diffusion capacity (51% of predicted). * Predicted values were obtained using the Knudson's reference equation. Her clinical and radiologic picture did not improve even after the two canaries were removed from her home. A subsequent bronchoscopy with bronchoalveolar lavage and transbronchial biopsy was done. The lavage revealed 75% lymphocytes and an unrevealing gram stain, GMS and acid fast bacillus (AFB) stain. Two weeks after the bronchoscopy, the lavage grew Mycobacterium avium complex (MAC). 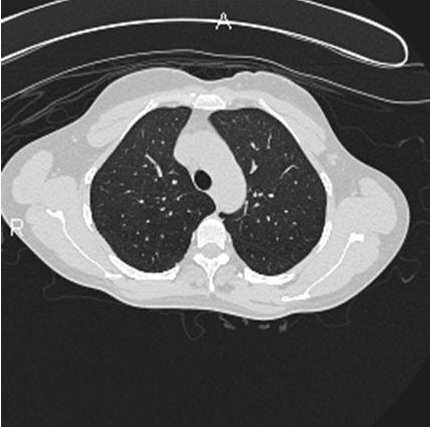 The transbronchial biopsy of the right upper lobe is shown in figure 2. Figure 2: Lung, right upper lobe (H&E, 10 X and 40 X original magnification in Figures 2a and 2b respectively). 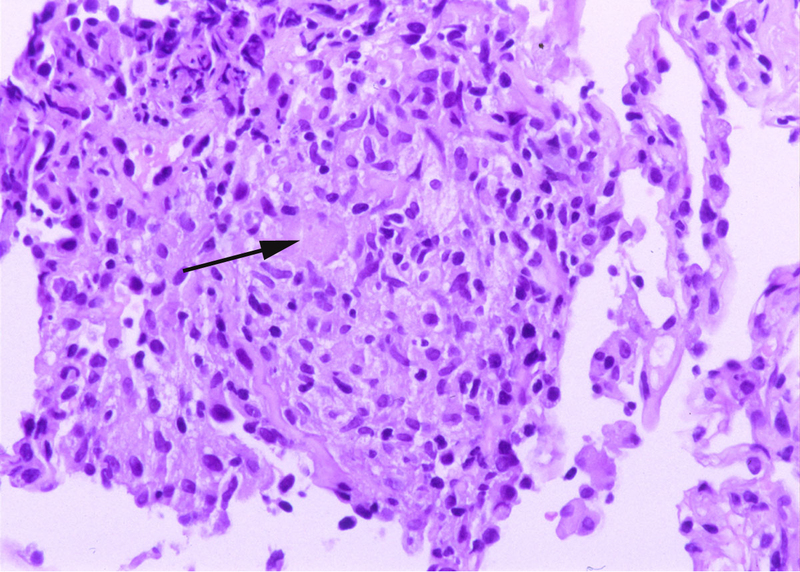 The transbronchial biopsy of the right upper lobe showed several non-caseating granulomas (white arrows in Figure 2a) with multinucleated giant cells (black arrow in Figure 2b). No acid fast bacilli or fungal organism were identified on AFB and GMS stains respectively. Given the clinical history, which ONE of the following is the most likely diagnosis? Hypersensitivity pneumonitis (HP) or extrinsic allergic alveolitis secondary to MAC is a newly described disease in literature 1-5. Outbreaks of HP have also been described from occupational exposures to metalworking fluids contaminated with non-tuberculous mycobacteria 6. 'Hot tub lung' is the most described MAC-related HP. Hot tubs are large baths, often shared, that are increasingly popular in the United States. Hot water may be agitated by powerful jets of air or of water that produce bubbles and hence aerosols. Some mycobacteria, such as MAC, grow well in the high water temperature of the indoor hot tub. The combination of poor hot tub maintenance, uninhibited MAC organism's growth, and jet aerosolization and subsequent inhalation of large amounts of MAC and related antigens presumably lead to the development of this disease. Interestingly, there have been no documented cases of hot tub lung with outdoor hot tubs. Askamit described 41 cases of MAC induced HP in a recent review of literature 2. Patients were mostly middle-aged with persistent exposure to indoor hot tubs. All had sub acute presentation with several weeks of dyspnea and cough being the most prominent symptoms. None of the patients were active smokers and there was a slight female predominance. Pulmonary function tests were mainly restrictive with some degree of obstruction in occasional cases. Chest radiography showed diffuse infiltrates in 85% of the cases, and HRCT showed ground glass opacities in about 90% of the cases with a nodular component in roughly 70% of the patients. Mosaic-type air trapping was also described frequently. Even though sputum culture was positive for MAC in about 70 % of the patients, transbronchial biopsy and bronchoalveolar lavage (BAL) cultures increased the yield to over 90%. Hot tub water invariably grew MAC 2. BAL revealed a lymphocytic predominance; and a high CD4 /CD8 ratio 2 unlike that seen in most cases of HP. 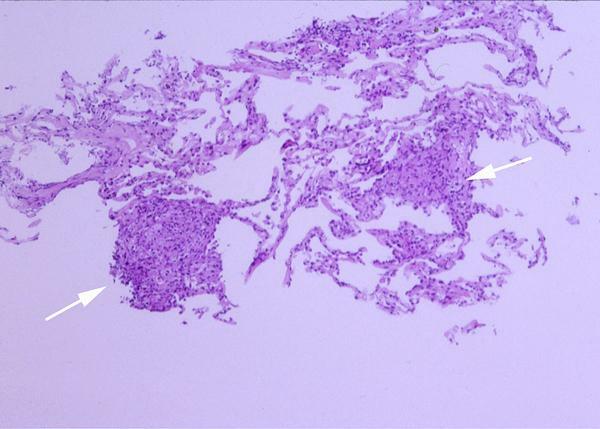 The histopathologic findings revealed discrete non-necrotizing granulomas (100%) with centrilobular distribution and were bronchiolocentric, along with evidence of bronchiolitis obliterans organizing pneumonia (12 - 47%), and patchy interstitial pneumonia (20%). Pleura, septa and bronchovascular bundles were usually spared 2. 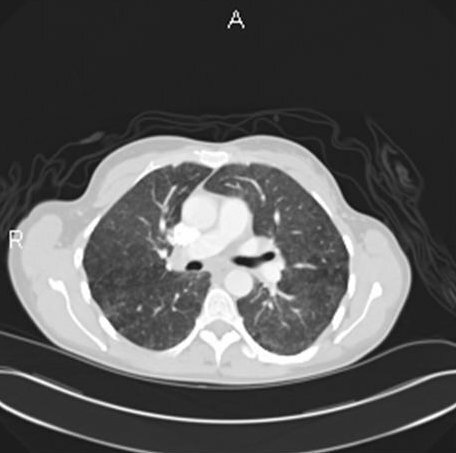 The granulomas described in this disease were more exuberant and well formed than seen in typical cases of hypersensitivity pneumonitis from other causes. Many patients diagnosed with hot tub lung have been previously misdiagnosed as sarcoidosis 7. The lack of bilateral hilar and mediastinal adenopathy argues against sarcoidosis. The histopathologic findings of sarcoidosis usually include coalescing granulomas with perilymphatic channels distribution and involvement of the pleura, interlobular septa, and bronchovascular bundles. They are often surrounded by a thin rim of chronic inflammatory cells. Marked interstitial pneumonitis extending into the adjacent pulmonary parenchyma is usually not a feature of the disease. It should be noted that sarcoidosis is a diagnosis of exclusion, and given the patient's exposure history, should be entertained only after excluding the possibility of HP. MAC rarely causes invasive infection in the immunocompetent host in whom it has been recognized mainly as a chronic nodular pulmonary infection, associated with bronchiectasis. Active diffuse MAC infection is usually seen in immunodeficient patients. Patients are usually very ill and tend to have other organ involvement. Radiographs reveal a diffusely nodular or miliary pattern. Histopathologic findings include prominent granulomas that overshadow the interstitial inflammation. The granulomas tend to be exuberant and very well formed. The radiologic picture in the present case makes asthma unlikely. The histopathologic picture of Wegener's granulomatosis is different and includes parenchymal necrosis and vasculitis, in addition to granulomatous inflammation. 'Humidifier lung' is the generic name for a form of hypersensitivity pneumonitis associated with the inhalation of contaminated water from humidifiers and is caused by one or more of several organisms like thermophilic actinomycetes, Sphaeropsidales, Penicillium sp, and Klebsiella oxytoca 3. In cases involving hot water, Pullularia, Penicillium sp and MAC have been implicated 3. Bromine and hydrobromic acid are found in the cleaning materials used to treat hot tubs. Inhalation of these substances in high concentrations may cause acute pneumonitis (within minutes of using the hot tub in contrast to the 4-6 hours seen in hypersensitivity pneumonitis) 8. This may be followed by development of reactive airways dysfunction syndrome (RADS). Other documented diseases with hot tub use including hot water fever, legionellosis, and pseudomonas folliculitis with possible associated pneumonia. a) Cavitary disease is seen commonly in elderly males with previous underlying pulmonary disorders such as chronic obstructive lung disease, pulmonary fibrosis, lung cancer, cystic fibrosis, or pectus excavatum. The radiographs reveal thin walled cavities in the upper lobes. b) Lady Windermere's syndrome is seen in middle aged nonsmoking women with previously healthy lungs. Chest radiographs reveal clusters of small nodules in the right middle lobe and the lingula with bronchiectasis 9.
c) Disseminated disease with pulmonary involvement is commonly found in HIV patients with CD4 count less than 100, and in patients with interleukin-12 or gamma-interferon defects. The chest radiographs reveal a miliary pattern in most cases 2.
d) Hot tub lung is believed by most people to be a form of hypersensitivity pneumonitis to MAC found in indoor hot tubs rather than a direct infection of the lung, though this subject is still a matter of debate 2. Which ONE of the following is the NEXT step in the management of this patient? c) A trial course of steroids. There exists no standard approach to treatment of hot tub lung. The literature describes significant improvement with mere abstinence from hot tubs 2. Oral corticosteroid treatment is usually helpful; some patients have received antimycobacterial therapy with or without corticosteroids and shown remarkable improvement as well (all were additionally removed from antigen exposure) 2,4. As the disease has been thought to be inflammatory and not infectious in nature, it appears to be very reasonable to give patients an abstinence trial without adding any treatment. On the other hand if no improvement is noticed or if the disease is severe, the physician should consider a trial of systemic corticosteroids. The duration of such therapy has not been standardized. Which ONE of the following is true about the natural course of the disease? The expected course of this disease following cessation of exposure is recovery without relapse 2. All reported patients in literature have had near complete clinical, radiographic, and PFT recovery irrespective of therapy given. Mycobacterial cultures in respiratory specimens resolve completely as well. Patients with hot tub lung are not expected to be at risk for developing future MAC infections 2. The patient in question was completely removed from further hot tub exposure and additionally received a short tapering course of oral corticosteroids. She showed complete resolution of the radiographic and pulmonary function abnormalities, and is currently symptom-free. Her follow-up computerized tomography of the chest is shown in Figure 3. An estimated 340,000 new hot tubs were sold in the United States in 1998, and it is highly likely that this number has increased. We recommend that physicians properly advise patients about hot tub use and maintain a high index of suspicion for hot tub lung in their routine review of symptoms in patients with respiratory problems 5.